Give a girl a stolen ring. Travel to Sadrith Mora to steal Brallion's Ring. Find Brallion downstairs in Fara's Hole in the Wall and steal or buy the ring from him. Deliver the ring to Ilmeni Dren in Vivec's St. Delyn Canton. For the fifth quest in this series, Jim Stacey asks you to steal Brallion's Ring (from Brallion no less, a right slave trader) and give it to Ilmeni Dren, a secret abolitionist. Brallion can be found in Fara's Hole in the Wall in Sadrith Mora and Ilmeni can be found here in Vivec's St. Delyn Canton. Travel to Sadrith Mora and find Brallion downstairs in Fara's Hole in the Wall (he's normally found outside of an alchemist's shop if you're not doing the quest). You can either buy the ring from him or steal it (if you kill him, you cannot complete the quest). When buying the ring, Brallion initially demands 1000 drakes. You can haggle this down to 800 or to 500 (disposition must be above 70). Once you have the ring, return it to Ilmeni in the name of the Bal Molagmer. She has an apartment in St. Delyn Canalworks, South-One, located downstairs on the outside (don't enter the waistworks, just go around the canton and you'll find her apartment on the south side). You can actually kill Brallion and still complete the quest. Buy the ring from him (never mind its outrageous price, you'll get the money back), and then taunt him into a fight and kill him. Because you had already completed the transaction, this way you get your money back and the ring. 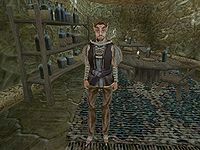 Brallion is also wearing the unique Amulet of Igniis, which cannot be pickpocketed from him. He disappears after this quest, so it is advisable to kill him or you miss your chance to get the amulet forever. Handing the ring to Ilmeni when not wearing the Gloves of the Bal Molagmer still completes the quest, but you only receive a +10 disposition boost from her. If you buy the ring from Brallion for 500 gold, his disposition towards you jumps by ten. If you offer 500 gold but don't have it, his disposition drops by ten. If you offer 800, his disposition jumps by 15, with a -15 penalty if you don't have the cash. 5 Gentleman Jim Stacey wishes for me to do something involving a slaver in the name of the Bal Molagmer. 10 Gentleman Jim Stacey asked me to steal Brallion's ring and give it to Ilmeni Dren. Brallion is a wealthy slave-trader in the Great Market of Sadrith Mora, and Ilmeni Dren is a secret abolitionist in St. Delyn Canton in Vivec. 20 I nicked Brallion's ring right off his hand. The Bal Molagmer would have been proud. 30 I bought Brallion's ring from him. It was a poor investment, but the obvious duty of the Bal Molagmer. 50 Ilmeni Dren accepted Brallion's ring, but questioned my knowledge of the Bal Molagmer. Perhaps I should have worn the gloves. 55 Ilmeni Dren accepted Brallion's ring, and seemed to have stories of the Bal Molagmer. 100 Finishes quest Gentleman Jim Stacey thanked me for stealing Brallion's ring and delivering it to Ilmeni Dren. 110 Finishes quest Stacey was unhappy to learn that Ilmeni Dren is dead, and does not want the Bal Molagmer to be associated with her death. 120 Finishes quest Stacey learned that Brallion was dead, and did not want to be associated with his death. This page was last modified on 16 September 2017, at 03:31.